In the whole built place of Zagori the wealth from the past years through stone mansions, schools and noble churches is obvious until today. During the period of Ottoman Empire, the status quo of self-government and the special tax-treatment joint with the emigration of the residents of Zagori and their successful occupation with the commerce and the Letter, led at economical, social and mental recovery of the region. This recovery was peaked at the 19th century and was reflected in the places and in the greater residential network. At the end of this century, Sarakatsanoi nomads cattlemen were settled in the region and some of them, until today, go on the traditional pastoral life, although the movements of their animals do not become on foot, as usual, but by modern trucks. From the region of Konitsa, the town of Konitsa is the administrative and economic centre of the area. At its feet lies the fertile valley of Aoos. 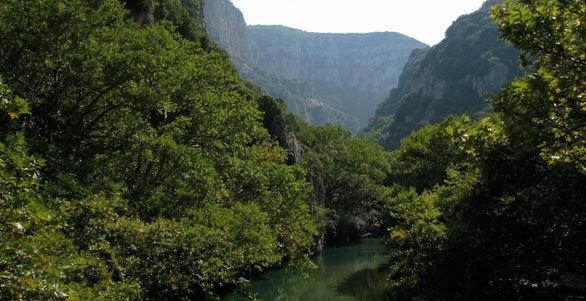 Aoos, Voidomatis and Sarantaporos meet in the valley, in an area inhabited since ancient times as testified by the findings of archaeologists. In the 15th century, Konitsa, although is subordinated at Ottomans, develops high economic activity, with farming, agriculture, small industry and trade. At the beginning of the 20th century the population of Konitsa is divided into two districts, upper Konitsa, where Christians and powerful families of beys inhabit and lower Konitsa, where mussulmen are more. The bargain of Konitsa, which survives until today, is the reference point and the meeting place of the residents and the merchants of the region. From the greater of Konitsa, Mastoroxwria discern. The residents of Mastoroxwria, who are masters of the stone and unique in the wood carving and hagiography, promote the development of a special local culture, mainly at the 18th and 19th century. For more than three centuries, they travel in all over the world and build every kind of buildings, leaving real masterpieces, which became legend and folk song. Hotel Faraggi is located between two important regions, Konitsa and Zagori, and between two rivers, Voidomatis and Aoos, in a nodal point, which is an ideal starting point for the visitor. It is allowed to sightsee at Zagori and Konitsa, easily and quickly, since the distance from the hotel is small. People of the hotel are at your disposal any moment in order to inform you on the possibilities the region offers and for where and how you go.